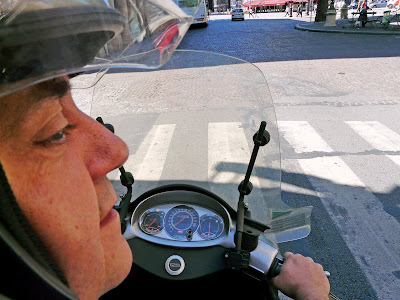 Did you have a photo-snapping passenger on the back of your scooter to take this cool shot? Emjoy the rest of your vacances, Eric! Or you could "enjoy" them! Hope you return with batteries well-charged. Is that really the expression in French? thought a battery was a "pile" and a "batterie" was a set of drums. Awwwwwwwwwwwwwww, that's a sweet photo and very appropriate. I'm glad you're using the proper protection while on vacation. A fun portrait it is! What fun to see you and your scooter out and about in Paris! Sounds like you had lots of fun in your own city while on vacation. I hope you were following all traffic laws and that it wasn't the long arm of the law taking this photo. Have fun down South! Enjoy the last half of your vacation! No internet access sounds like a nice idea especially since Tomate has suggested a virtual party! What you don't know won't hurt us. Okay, Tomate I'm in! Did someone say A PARTY while Eric is away? Yippee! Jeff ~ What protection are you talking about? I think it's really funny that you tagged the photo "unusual!" Oooohhhh, that does it. I must, must kiss you now. Oh dear Eric I missed so many pictures!.. Not my fault though, its hard to find a good internet access here. Bonnes vacances, without internet and everything: real vacations! Y besos a todos de Mexico... I miss you all!! Greaaaat photo Eric!!!! Have fun in the south!!! We'll try to be good while you're away! What could beat two weeks in Paris? Where could Eric go that has no or limited internet? OMG! You're coming to Tinytown Texas?? I won't be back for two more weeks!! Stop being where I'm not- I'll never get to meet you! Attention aux coups de soleil, et à l'effet nocif des petits apéros au pastis sur le régime ! LOL !! Awesome photo,Eric - I love it! Its lovely that you'll be going someplace unplugged. My batteries are always much better recharged in those places (and even tho my mind tells me I'm missing all sorts of vital info, it always turns out that none of it really is). Have a wonderful holiday, Eric. You guys are a bunch of troublemakers! P.S. -- Count me in. Have a beautiful week in the South, Eric ! Very funny photo, very nice ! Bon vacance! Have a wonderful time in the lovely south! Bonnes vacances, Eric ! Reposes toi bien ! Alexa, the difference between "une batterie" and "une pile" is that you can recharge la batterie when it's empty, while la pile must thrown away (sorry: recycled!). Adorable and à propos self-portrait. Next time, rent a place with wifi. We need our little internet fixes when on vacation too. Relax, put your feet up, enjoy the scenery, the food, l'heure de l'apéro, a good book and some good company (we hope)! I love it, Eric. Have a wonderful time. I'm a day late for the send-off but safe scooting and happy holidays, Eric!